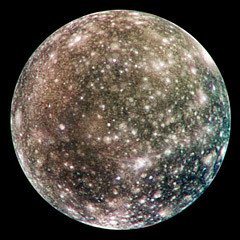 Callisto [kah-LISS-toe] is the second largest moon of Jupiter and the third largest moon in the Solar System. 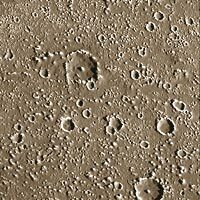 It is only slightly smaller than Mercury, but contains only one-third its mass. 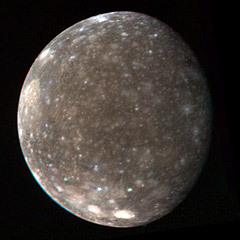 Callisto was named after a nymph in Greek mythology who was a love interest of Zeus. When Hera, queen of the gods, found out about the relationship, she changed Callisto into a bear. Zeus then placed her in the heavens as the constellation Ursa Major (the big dipper). Callisto was discovered by Galileo Galilei and Simon Marius in 1610 and is one of the four Galilean satellites. Callisto is without a doubt the most heavily cratered object in the known solar system. This suggests that the surface is very old and inactive. The largest impact crater on Callisto is known as Valhalla. It is 2,485 miles (4,000 km) in diameter. Another large crater, Asgard, has a diameter of 994 miles (1,600 km). It appears that Callisto's surface has undergone very little change since its formation over four billion years ago. Because its surface is so geologically inactive, astronomers believe that Callisto may represent what many of the moons in the Solar System may have looked like at a much earlier stage in their development. Callisto is very different from other rocky moons in the Solar System. There are no mountains on Callisto. Astronomers believe this to be a result of movement in its icy surface. 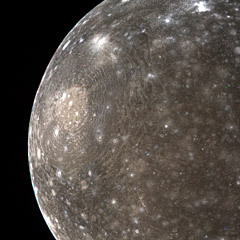 The entire surface of Callisto is covered with craters. 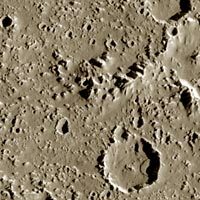 The largest craters have concentric rings that look like huge cracks in the surface. These rings may have formed when water beneath the crust leaked through to the surface. Like Ganymede, Callisto's craters have been smoothed out by the flow of its icy crust. 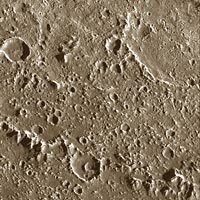 The craters lack the ringed mountains and central depressions that characterize craters on Mercury and the Moon. One very interesting feature is known as Gipul Catena. This is a long series of craters arranged in a nearly straight line. This was likely caused by an object that was broken into several pieces by tidal forces before it impacted the surface. Callisto has an extremely thin atmosphere of carbon dioxide. No evidence of a magnetic field has been detected. Callisto has the lowest density of the four Galilean satellites. Astronomers believe it has a crust about 124 miles (200 km) thick. They also believe that beneath this crust may exist a salty ocean. Callisto's core is believed to be composed of compressed rock and ice.